There are many world class conference venues in Cape Town central from which you can choose. The following are some of the venues we recommend for you to use to host your next conference. The Barnyard Theatre in Cape Town seats 500 delegates and can be hired for Team Building, Year End Parties, Product & CD launches, Awards Ceremonies, Client Entertainment, Dance Recitals, Festivals, Competitions, Graduations, School Concerts, Bachelorettes, Birthday Parties, Hair Shows, Fashion Shows, Roadshows and Weddings. Conference packages can be tailor-made to suite your needs. Conferences are held in the main theatre or the conference room. The Barnyard Theatres are unique venues, with the added benefit of stages, kitted out with state-of-the-art sound and lighting equipment. Our fully qualified sound and lighting technicians are always willing to go the extra mile. The ease of this “plug and play” setup is what makes Barnyard the obvious choice when seeking a venue. ABH Training is the ideal venue for small conferences, training sessions and business meetings in Cape Town central. The modern, stylish conference room seats up to 16 delegates and includes air conditioning, white board, flip charts, projector screen, laptop and a data projector. The venue is centrally located in Thibault square with safe underground parking, and close to all public transport. The meeting room can be set up in boardroom style or classroom style. The Pavilion Conference Centre offers state of the art facilities, easy parking, 1117 hotel rooms within walking distance and access to all the major highways in Cape Town. The Pavilion team offers clients a one stop value added service by being able to organize decor, security, transfers and specialized AV equipment to accompany any conference enquiry. The venue has stunning views of the harbor and can accommodate maximum capacities of up to 600 delegates for a cocktail event; 300 delegates for a gala dinner and up to 500 delegates cinema style seating. Upper Eastside Hotel in Cape Town offers a selection of affordable conference venues, with state-of-the-art audio-visual technology and an experienced and professional team to help you plan and realize a successful conference or strategy meeting. Choose one of the eight modern, fully-equipped rooms – from the intimate Queens 1, able to host 14 (boardroom meeting configuration/furnishing) to 60 (cocktail party), to Central 2, able to host 30 to 120 delegates, depending on your needs. Upper Eastside Hotel is conveniently located for your Conference in Cape Town, within striking distance of the airport, Cape Town’s CBD and business parks. The hotel also offers complimentary undercover controlled-access parking for any number of guests. Cape Pillars Boutique Guest House is a new listing on the Conference Venues website. Cape Pillars Boutique Guest House is a world of absolute luxury and refined elegance. Whether your accommodation needs are leisure, corporate or relocation, Cape Pillars offers warm hearted hospitality in the heart of Cape Town North. The guest house is situated in the heart of Durbanville, an upmarket suburb of northern Cape Town, Cape Pillars is conveniently close to the city centre, yet still far enough to experience some relaxation. Enjoy many of the wine estates right on your doorstep, experience the fine dining and many tourist attractions in the area or hop over to the central business districts. The suites boast Superior Accommodation status by the AA and four star accreditation by the Tourism Council of South Africa. Being affiliated with several tourism bodies in the Western Cape supports an overall solid reputation for personal service and quality accommodation. Cape Pillars is devoted to attention to detail and guest satisfaction – ensuring superior comfort in a spacious, secure and sunny location. Business or holiday; bed and breakfast, self catering or full boarding; long stay or overnight – Cape Pillars welcomes you to the Mother City. Cape Pillars has eight stylishly decorated rooms, fully air conditioned, each with an en-suite bathroom –with shower and bath, or only shower. From antique Victorian to classy retro, each room is uniquely finished and individually themed. Comfort is emphasized by extra length king size beds which can be split into twins with the finest percale linen, plush down duvets with freshly laundered towels. A fully equipped kitchenette containing a microwave, fridge, kettle, toaster, coffee facilities, crockery and cutlery provides a self catering option. Breakfast is conveniently prepared by chefs, served in the main dining room or on the covered patio, leading to the garden and pool. Rooms are serviced daily for optimum comfort. All Units are equipped with electrical blankets and air conditioners. Televisions with DSTV and DVD players provide some light entertainment. A desk and wireless internet connectivity are available throughout the entire establishment. A private lounge with a library, DVD collection, books and chess board is available to unwind after a busy day. The 4 ground floor rooms offer direct access to the pool and garden. The north facing patio, where one can simply relax or entertain friends, family or business associates around the undercover barbeque – with views of the sparkling pool and manicured garden. A communal kitchen serves the upstairs rooms, ideal for larger groups or families. The property has safe off-street parking and access is limited by a remote controlled gate and. Cape Pillars caters for corporate travellers, honeymoon couples, families and international visitors – whether for business, leisure and relocation and longer stays. Apart from the professional accommodation service, the modern fully furnished venue offers flip charts, data projector, laptop connections, stationery and automatic screen – making it ideal for corporate workshops, product launches, small seminars and meetings. The north-facing, double volume, open plan function venue extends onto a covered patio, pool and garden area allowing easy flow and convenient social interaction. The facility can therefore also be utilized for private events, including private parties and year end functions. Whether it is an afternoon tea or a five-course dinner, Cape Pillars will cater to your individual needs. Half and full day packages are available with optional catering. Meal and snack times can be specially catered for or be ordered off the guesthouse menu and generally include an arrival coffee / tea, lunch, snacks and refreshments. The Caledon Hotel Conference Venue is located only an hour’s drive from Cape Town. The Caledon has a range of conference and corporate event options available to suit any requirements including dinners, private functions, product launches, press conferences, dinner dances, awards functions, private parties, seminars, business meetings, corporate events and team building. The River Club Conference Centre in Observatory, Cape Town has announced a Winter Warmer conference special on their half day and full day conferencing packages. For the months of June, July and August full day conferencing packages will be R240 per person and half day conferencing packages will be R210 per person. Host your next Cape Town conference in a truly unique and inspiring venue. 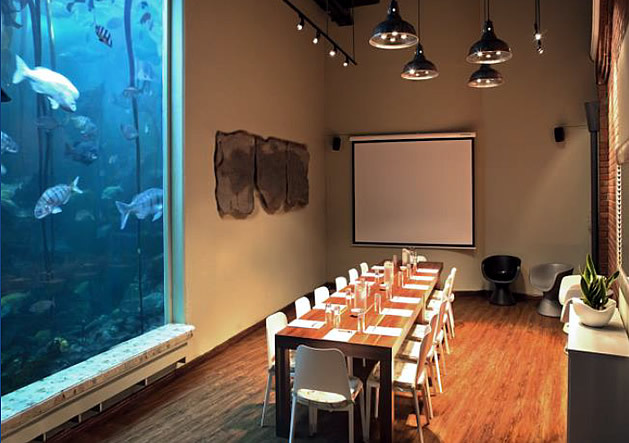 Until 31 August 2013, the Two Oceans Aquarium conference venue in Cape Town is offering special winter warmer conference packages for half- and full-day conferences. 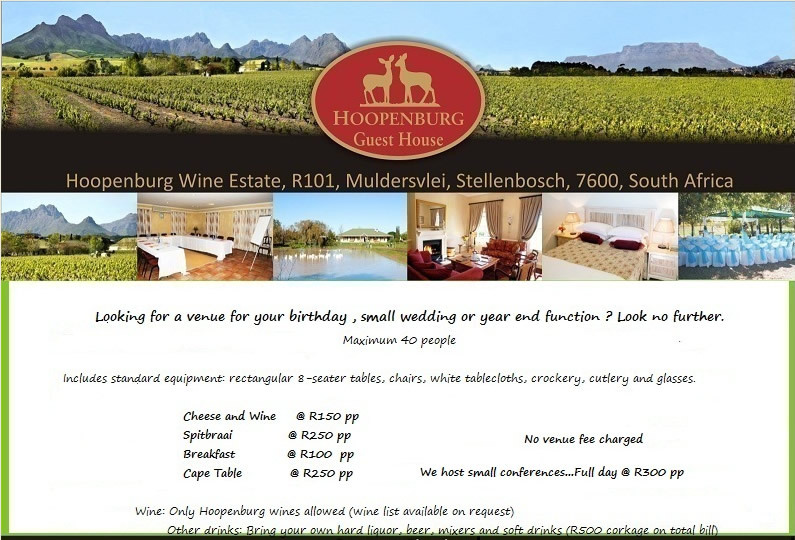 The half-day package at R205 (excl VAT) per person is valid for conferences between 08:30 and 13:00 daily. The full-day conference package at R245 (excl VAT) per person is valid for conferences between 08:00 and 17:00 daily. Both packages include all catering breaks, staff costs, mints, notepads, pens, jugs of water and access to the Aquarium (between 09:30 and 18:00) for conference delegates. The packages exclude any additional beverages and a minimum number of 20 delegates are required per booking. The Two Oceans Aquarium offers conference organizers two equipped venues to choose from. Opening onto the Marina Residential and with a magnificent view of Table Mountain, the Auditorium Think Tank provides the perfect space for knowledge-sharing, creative thinking and strategic planning. 1 June – 31 August 2013. Minimum 20 pax per booking. The Ruslamere Conference Centre is known for its atmosphere of luxury and tranquility as well as its friendly and efficient service at all times. Conveniently situated in Durbanville mid-way between the Winelands and Waterfront, just a mere half-hour’s drive from Cape Town’s CBD and the Cape Town International Airport, Ruslamere is considered by many as the number one choice for executive conferencing in Cape Town’s Northern Suburbs. With six luxury conference venues at its disposal, Ruslamere is the ideal venue for conferences, seminars, workshops, functions, product launches and weddings. Large functions for up to 140 conference delegates can be accommodated on the domed pool deck over the indoor swimming pool. For conference accommodation, Ruslamere has 32 luxury bedrooms where delegates will be accommodated in style. 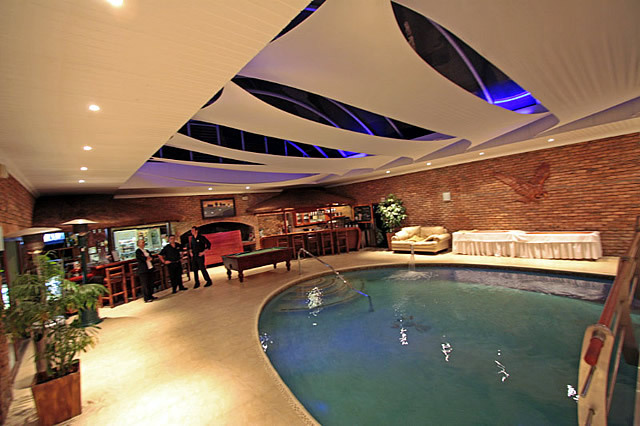 The venue has a Spa, indoor and outdoor pools and gym, in addition to its conference facilities. The conference centre also has service partnership agreements offering delegates additional services such as relaxation and beauty treatments and professional décor advice. Conference accommodation at Ruslamere is upmarket and facilities in the rooms are modern. There are four types of rooms to choose from including luxury studios, loft apartments, executive suits and self-catering studios. All the rooms are equipped with air conditioning, telephones, electrical safes, pocket coil mattresses and down-feather duvets. Ruslamere offers conference delegates airport shuttles, point to point transfers, car hire, as well as chauffeur drive services. You can also be assured that you will be able to access your emails and surf the internet with Wi-Fi connectivity throughout the venue. The owners of the Ruslamere Conference Centre are Russel and Gisela Rathbone, are actively involved in the day to day running of the venue. They and their staff have a professional approach and attention to detail, ensuring that a high level of service is always being met. Ruslamere is fully accredited by the Tourism Grading Council and AA Quality Assurance Program. Ruslamere has six luxurious upmarket fully air conditioned venues furnished with multimedia equipment and light-blocking curtains. There is a collection of standard conference packages available, but Ruslamere will gladly customize a package to your specific requirements. The four types of rooms available for conference accommodation at Ruslamere are luxury studios, loft apartments, executive suites and self-catering studios. Luxury Studios include luxurious bedrooms with en-suite bathroom and writing desk as well as modern hotel facilities. Self-Catering Studios all have spacious bedrooms with en-suite bathrooms and a writing desk. The rooms include a kitchenette equipped for two people. The Executives suites have spacious bedrooms with a private lounge and full bathroom. The Lofts are luxury double volume units with an open plan lounge and kitchen area and main and en-suite bathroom upstairs. Ruslamere’s Pure Day Spa and Wellness Centre is the perfect place to relax the body and soothe the mind. Facilities at the Spa include a Cedar-Wood Sauna, Steam Room, Jacuzzi, Nail Studio and Gym. Here, you will receive the highest quality of personal service, and a qualified therapist is at hand to assist you. The spa has four private treatment rooms of which two are double rooms. A variety of treatments are offered by the Spa including facials, manicures, massages and indulgence packages.